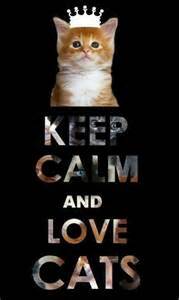 Today is "Hairball Awareness Day"......so, with that in mind, here is the cat quotation for the day.....although I can't imagine someone actually putting this into a book!!! "The sun rose slowly, like a fiery furball coughed up uneasily onto a sky-blue carpet by a giant unseen cat." Okay, so I really...ummm..."dropped the ball" today because I do NOT have a cat card for you for Hairball Awareness Day! But who had ever heard of that special day until maybe yesterday???? 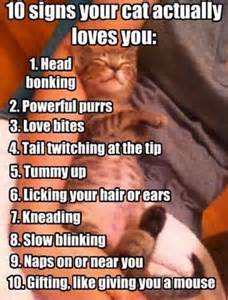 (Besides, what cat owner is NOT already verrrrrrry aware....and wary...of hairballs???!!) With more Grandma duty than usual and my trusty back-up gone for a few days, I hardly had time to finish this project for the Unity Friends with Flair today....much less "cough up" a clever cat card for the holiday! Ackkkkkkk! 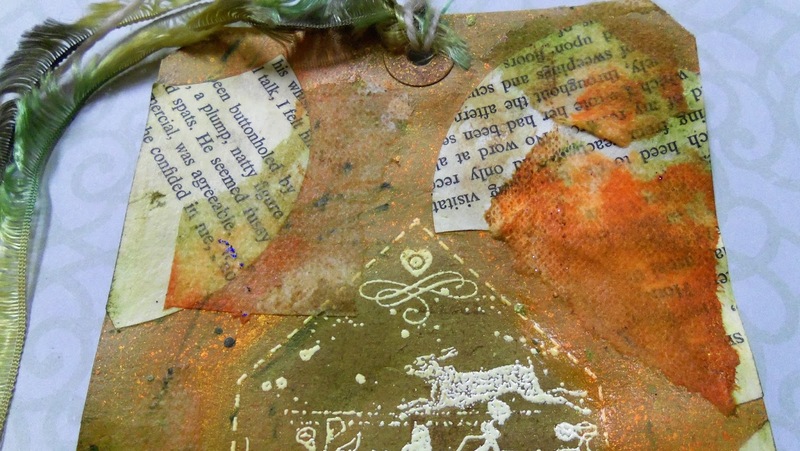 What I did manage (barely) to finish up was a mixed media tag. It is the first tag that I've ever made!!! I have put them on cards before, but never made just a stand-alone tag. Everyone always says how easy they are, but for some reason I find them incredibly intimidating. EEEEK!!! 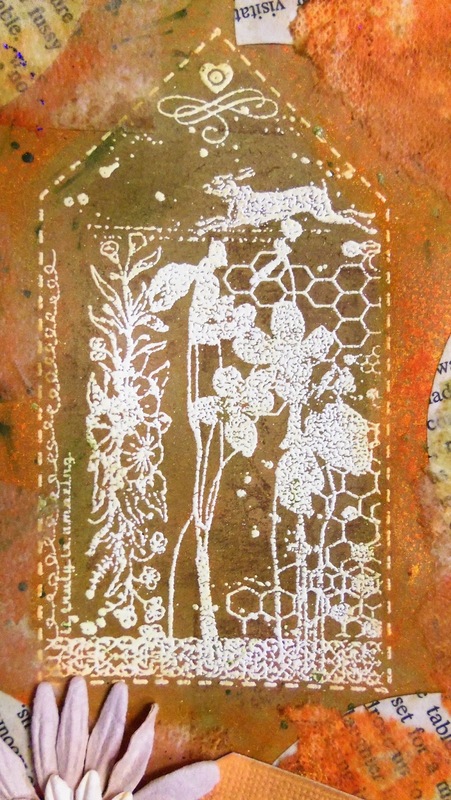 I heat embossed the image in white on a kraft tag. Then I misted and sponged and sprayed all sorts of different products all over it.......not having any idea what I was doing!!!! Then knowing it couldn't look any worse than it already did, I took my gigantic circle punch and went willy-nilly punching (mostly partial) circles from a text page I use for my art journal book. I glued them on and...............it looked worse than it did before!!! Ha!! 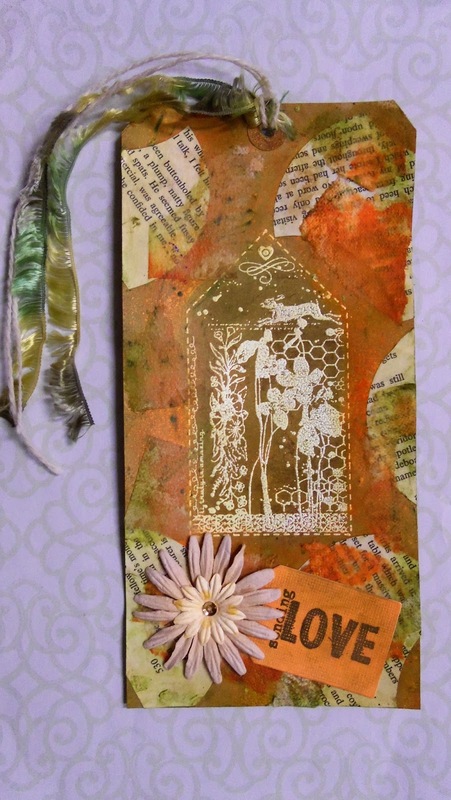 I added a little mini-tag using a Sending Love stamp from the Unity - Antique Butterfly set with some layered Prima flowers. Then I tied on some twine and feathery yarn to finish. A big welcome to Patti J of Cherish Each Precious Day. 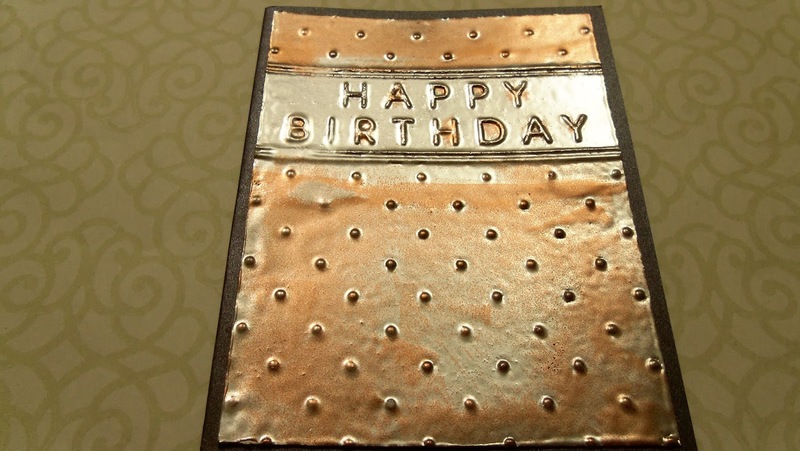 Patti is an amazing designer whose cards always have such a sense of fun!!! You will enjoy seeing all the things she makes for the many teams she helps with!!! Thank you, Patti, for becoming a follower. It really means a lot to me!!! This ginormous smile is for you!!!! Next is Dawn from Designs by Dragonfly. Oh, my....Is there even one challenge that Dawn does not enter and win????? She is a regular at Unity - Friends with Flair and her cards are just always so amazing.....not to mention that there are tons of them!! Where does she find the time???? I am in awe! Thanks so much, Dawn, for becoming a follower!! This ginormous new-follower smile is all yours!!! Okay, friends, that's all for tonight! Thank you so much for visiting and for your wonderful comments!!! 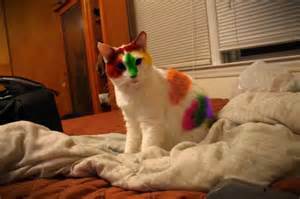 "Watch a cat when it enters a room for the first time. It searches and smells about, it is not quiet for a moment, it trusts nothing until it has examined and made acquaintance with everything." A Personal Note: I want to thank each of you for all the wonderful comments you have left on my blog lately. I am overwhelmed with gratitude for all your support.....especially on my Light it Up Blue - Autism Awareness Hop project, a tribute to my daughter. She loved the art journal page I made for her and was touched, in particular, by those comments that sent greetings and hugs to her. 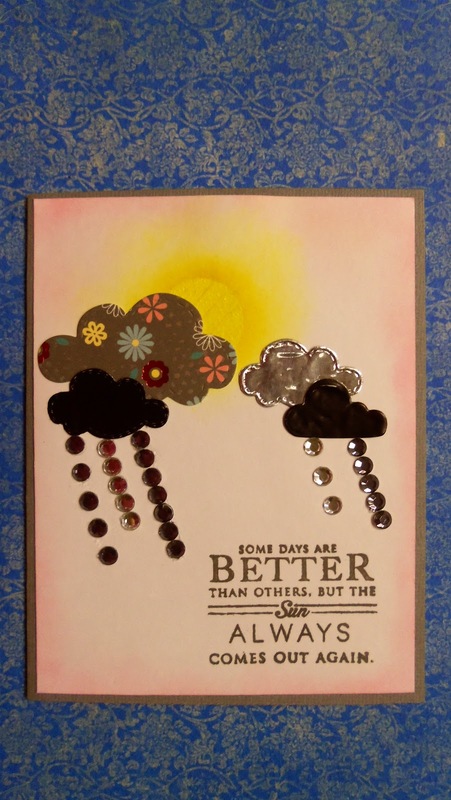 I'm here today with a sweet little card I made with my Stampendous! 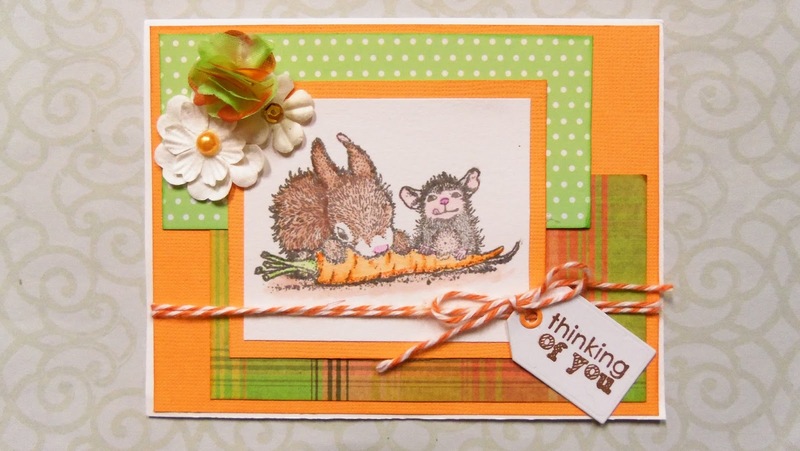 - House Mouse Designs - Carrot Friend stamp I won from them a while back. (THANKS, Stampendous!!) 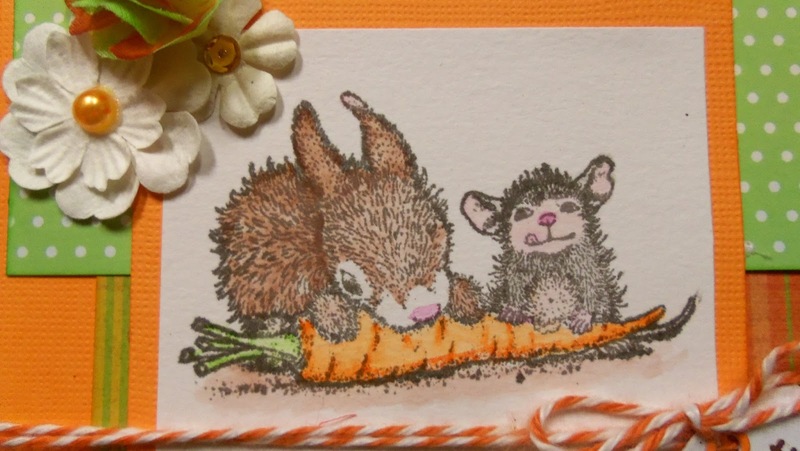 I am so excited because this is my first ever House Mouse card and I think all the images are soooooo adorable!!!! I watercolored my image very simply using my aquabrush and Crayola watercolor pencils. Such a sweet image.....and so fun to paint!!! I finally discovered (maybe) how to use some flat silk flowers I found a long time ago in a thrift store. 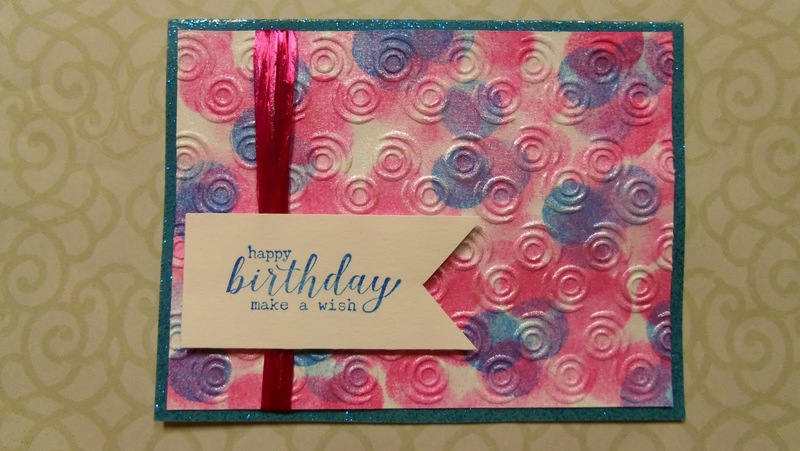 I have layered them before, but this time I tried layering and then folding the layered stack in quarters and gluing the bunched-up bundle onto my card. I really like how this two-toned blossom turned out! 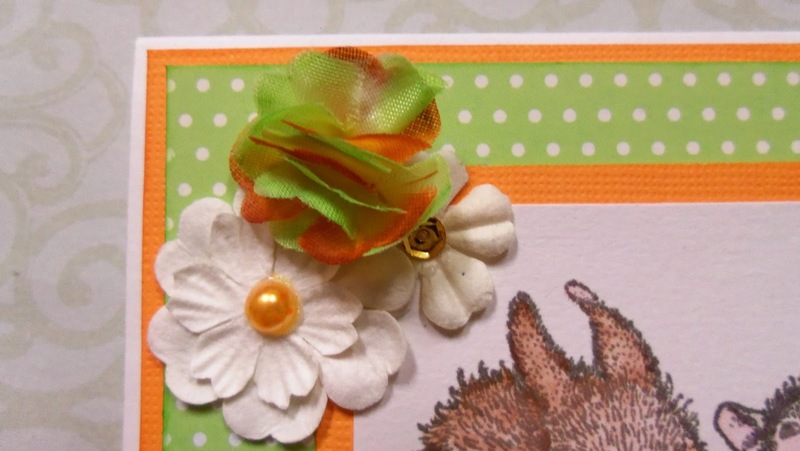 A couple of Prima flowers with pretty centers and a length of twine finished off this cheery card. Hope you like it!! Ding, ding, ding.......NEW FOLLOWER INTRODUCTION TIME!!! Do you see what she did with her name there?.....Alena / AnelA's Creations. :) Cute, huh! (It would never work with Janis....SinaJ....Huh??? Epic fail!! lol...) Alena is on the Creative Crew Team for A Creative Journey with Melissa with a big emphasis on CREATIVE!!! I got acquainted with her work on a recent hop and was so impressed with the super-clever and fun ways she used the new release items!!! Alena, thank you so much for becoming a follower. I appreciate your support and encouragement more than you can know!!! This ginormous new-follower smile is what breaks out across my face when I see a new pic on my sidebar gadget!!! Thank you to all my readers. If you are a follower and I somehow missed getting you introduced...(or if you just want to be introduced again!!! ).....please mention it when you comment. I don't want to miss you!!! Hope you have a lovely start to your weekend!!! 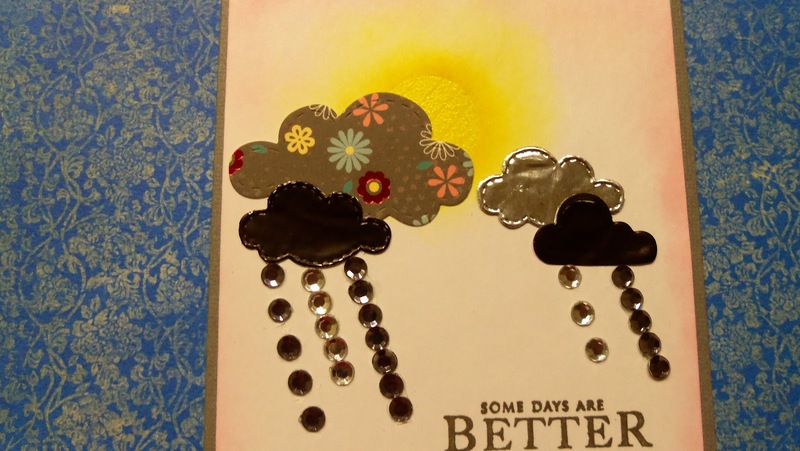 For this card I die-cut several clouds from DCWV patterned cardstock and Add a Little Dazzle craft metal (the black diamond color and the silver reverse) using dies from Lawn Fawn Into the Woods and Lil' Inker Rainbows and Clouds sets. I arranged the clouds where I wanted them on my white cardstock using repositionable adhesive so I'd know where I wanted to stamp my sun. 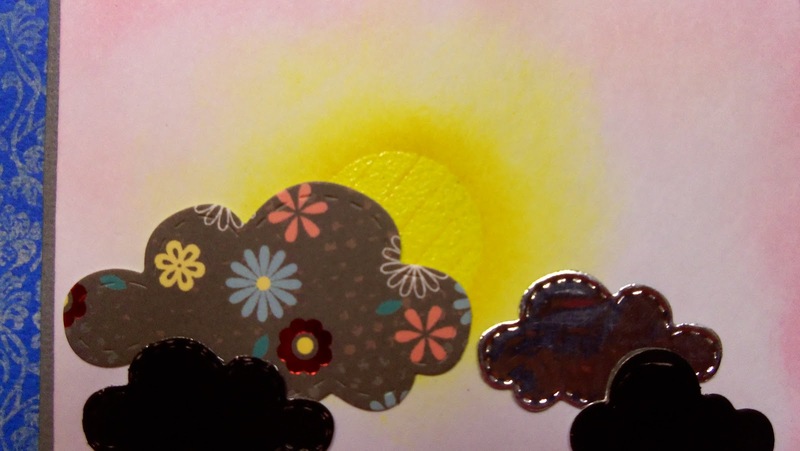 Next, I took my clouds off and stamped the sun with Versamark ink using one of the circles from my Waffle Flower - Flower Circles stamp set. I heat embossed it with bright yellow powder and then sponged over and around the sun with Distress Ink - Mustard Yellow for a shining halo.....making sure I put enough ink on the disc itself to show the lines of the stamp. You can see the detail of the sun in the shot below. 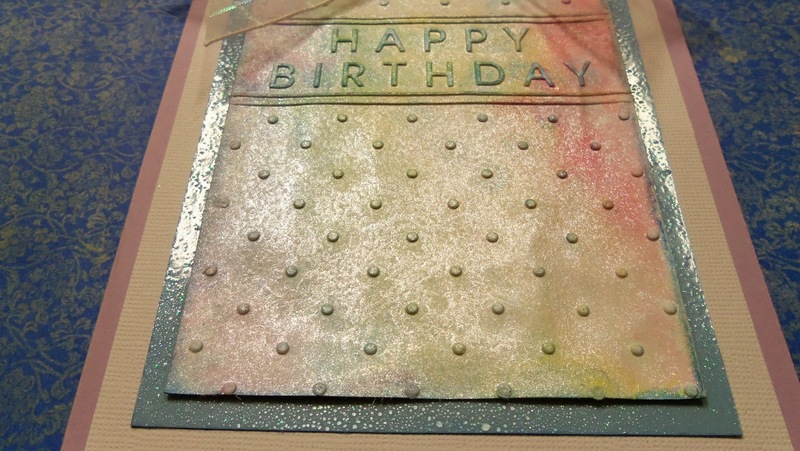 I also sponged around the edges of the cardstock with Distress Ink - Worn Lipstick. Then I adhered my clouds using Beacon 3-in-1 craft glue. 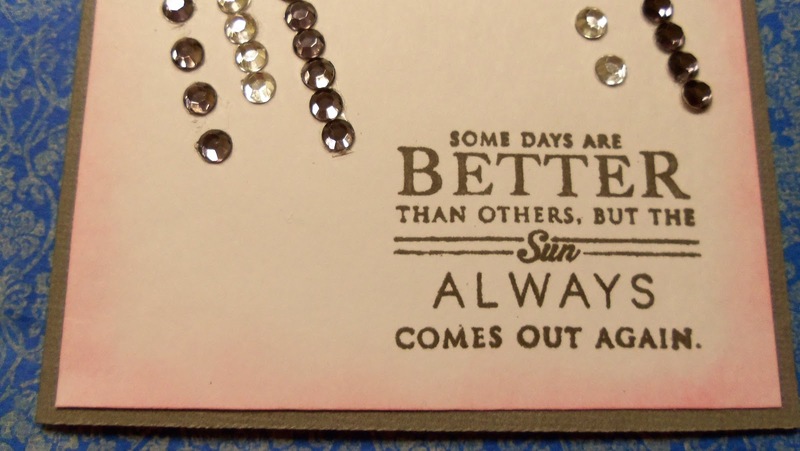 Next, I stamped a wonderful sentiment from my PaperTrey Ink - Hello Sunshine stamp set using Versafine - Smokey Gray ink. Now that I had everything place, I put on my raindrops. I sketched out with a pencil some parallel lines....so my rain would be all going in the same direction!!! lol... This clearance rack package of little rhinestones (in smoke and clear colors) had them individually and in strings which I cut to length and adhered with additional liquid glue. By using the glue instead of only the adhesive that came on the back, I had some wiggle room for getting them arranged in the right place. 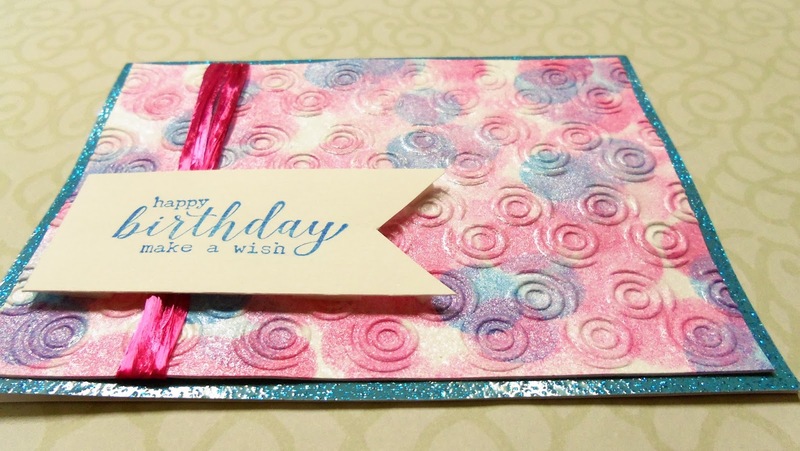 I really love how this card turned out and hope you do, too!!! Thank you for all your wonderful comments. They are very much appreciated!!! I decided to go with flowers instead of clouds for my card, but stayed in the charcoal, pink, gold, and white color scheme. I have been playing around with my Waffle Flower - Flower Circles stamp set and discovered I could make cute flowers that look a bit like the Waffle Flower logo using a couple of the pieces. How fun is that?!! Can you find the two pieces I used? The flower center is the lined circle and the petals are the little half circle next to the Hello word. Isn't it cute how they fit together??? Love how this set is designed to construct so many different flower styles!! In this angled shot below, you can see that I added shimmer spray to my background. I also used my scallop scissors on the edges to echo the petals of my flowers. Hope you enjoyed my card. I had a lot of fun playing with my Waffle Flower stamps!!! I have one more Waffle Flower card to post, so I will see you soon! 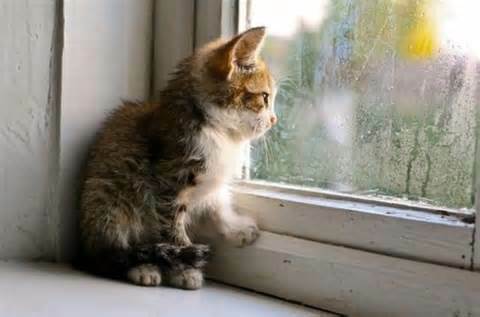 "A kitten is chiefly remarkable for rushing about like mad at nothing whatever, and generally stopping before it gets there." 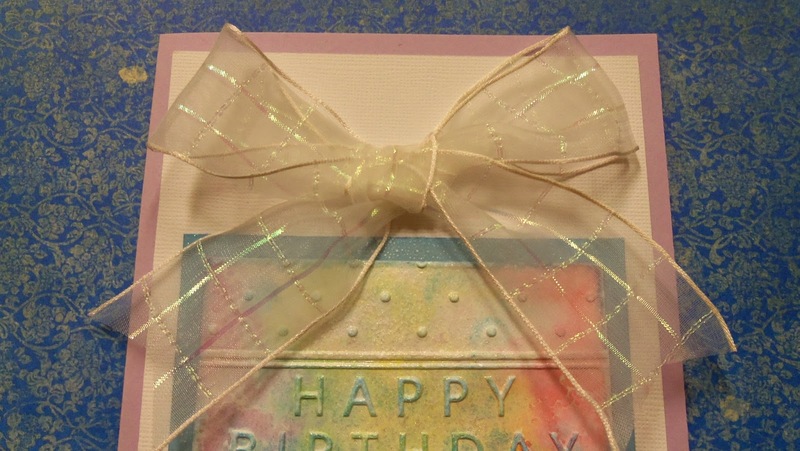 This might be the prettiest one of my cards in this group, although I always wish I could photograph better! Does this look iridescent to you??? It sure does in real life! 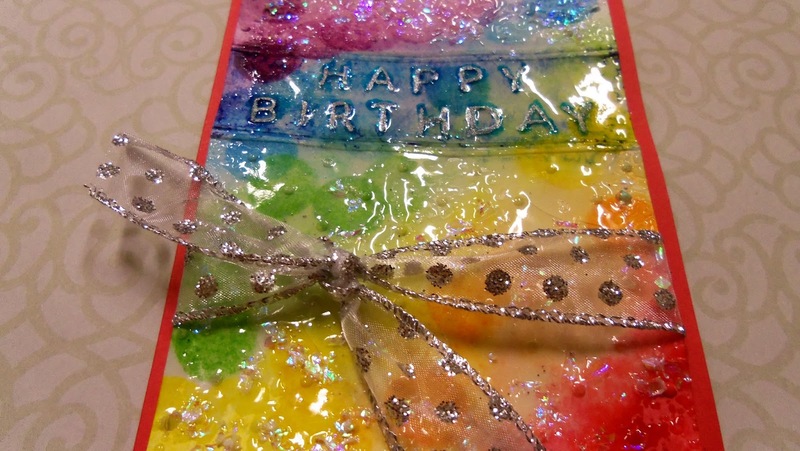 I daubed distress inks directly onto my Darice Birthday with Dots folder in rainbow stripes and then misted it with water before inserting the cardstock. The colors turned out so soft and pretty!!! Then when I used my Perfect Pearls shimmer mist, the whole piece took on a glow of its own. I LOVE this!!! I tied a big bow with some sheer iridescent ribbon to put on top. Almost looks like a birthday present, doesn't it? Okay....four cards posted and I am racing on to the next. See you soon!!! 2. 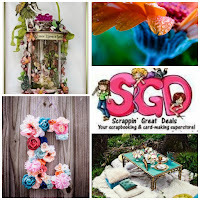 Scrappin' Great Deals Mood Board Challenge - I was inspired by the blue table surrounded by white in the lower right. 3. 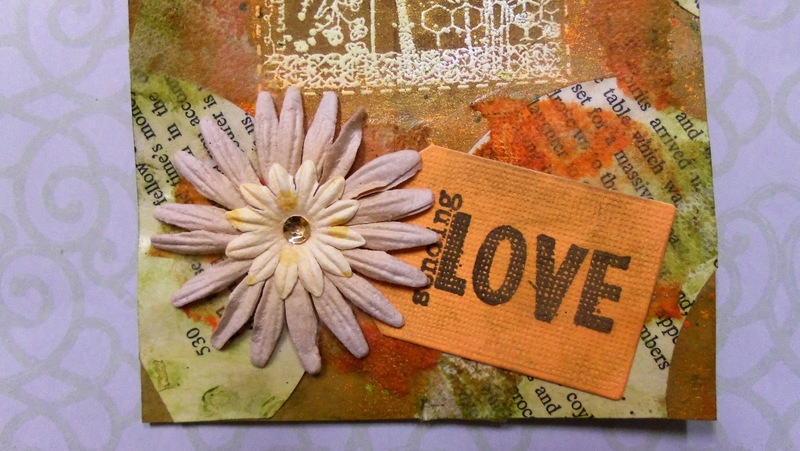 Design Memory Craft April 2015 Challenge - Creativity - Creativity to me is experimenting around with products in new ways and finding an effect that I love!!! "In its flawless grace and superior self-sufficiency I have seen a symbol of the perfct beauty and bland impersonality of the universe itself, objectively considered, and in its air of silent mystery there resides for me all the wonder and fascination of the unknown." 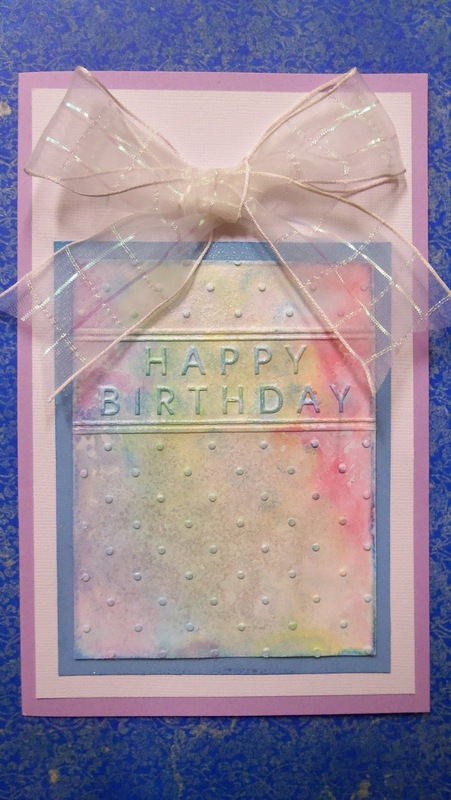 This card is the only one of the five using a different embossing folder. This time I used my Darice - Swirly Circles folder. 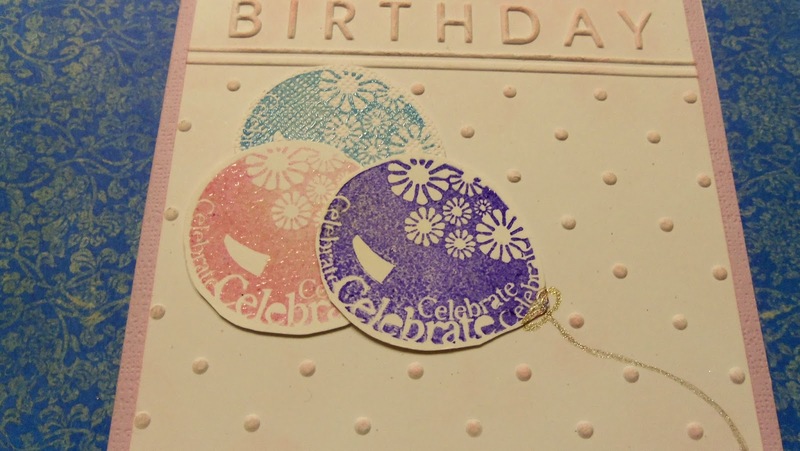 I first used my daubers like round stampers with my Distress Inks and made what I think looks like a bokeh effect. Do you? I am not usually big on bokeh, but I just LOVE how I accidentally stumbled on how to do it!! 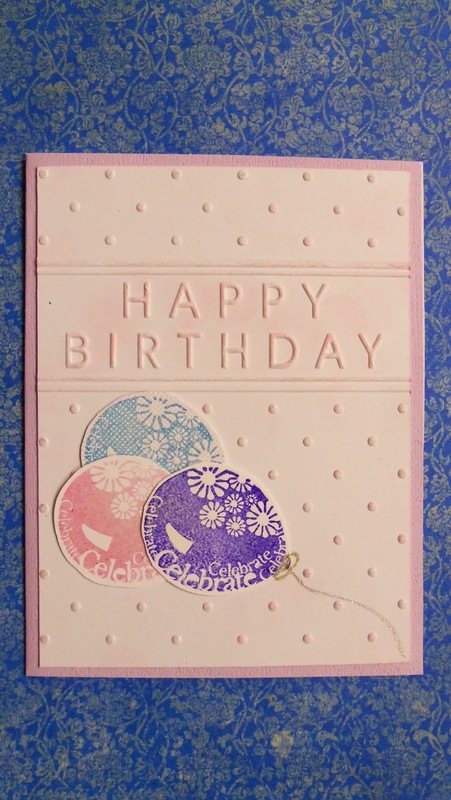 After dry embossing my background, I sprayed it with some Perfect Pearls shimmer mist in the original flavor...lol... Then added a simple birthday sentiment from a Unity grab bag. I will edit this post on Friday to enter the Unity Friends with Flair. This angled shot shows the shimmer and texture a little bit better. I really love how this card turned out. 2. 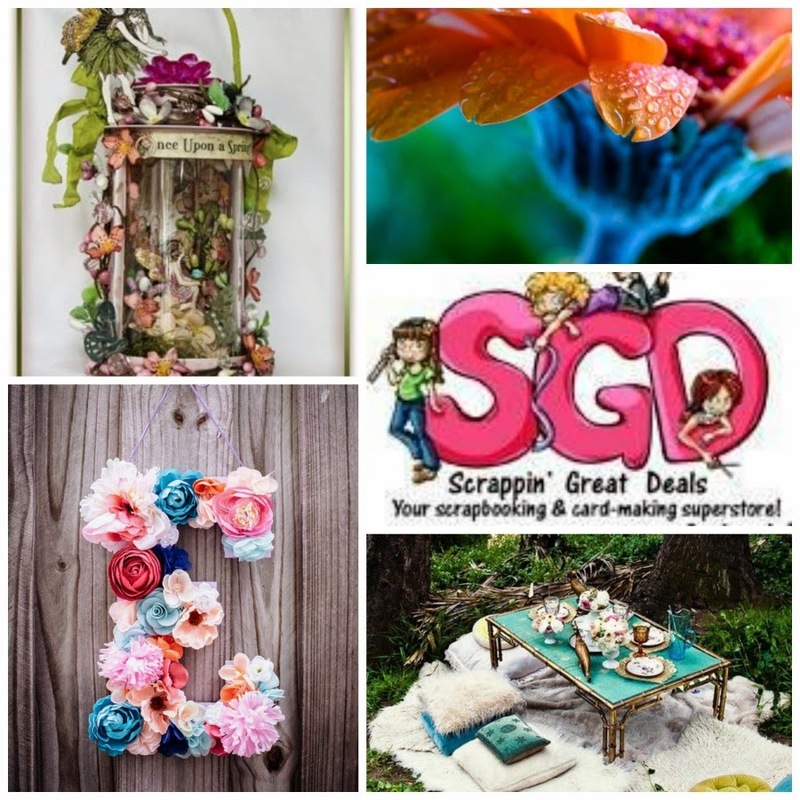 Scrappin' Great Deals Mood Board Challenge - I was inspired by the pink and blue flowers together in the lower left. 3. 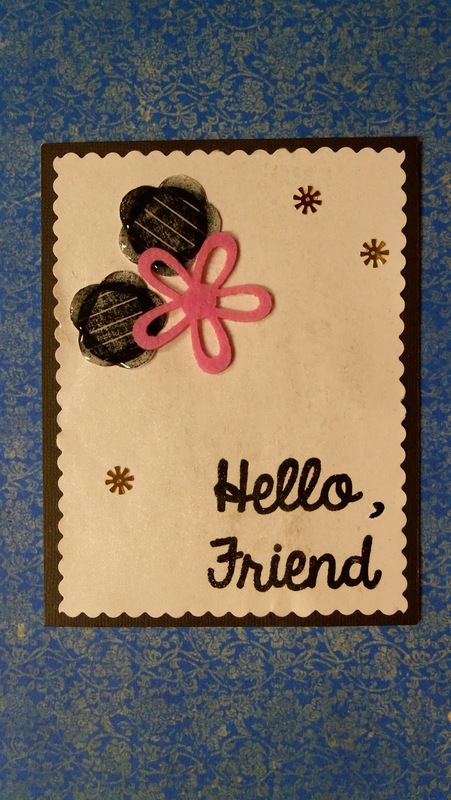 Simon Says Stamp Monday Challenge - A is for.....Accidentally discovering a new effect with my daubers!!! 5. Design Memory Craft April 2015 Challenge - Creativity - Creativity to me is experimenting around and accidentally discovering a new effect...like my bokeh!! 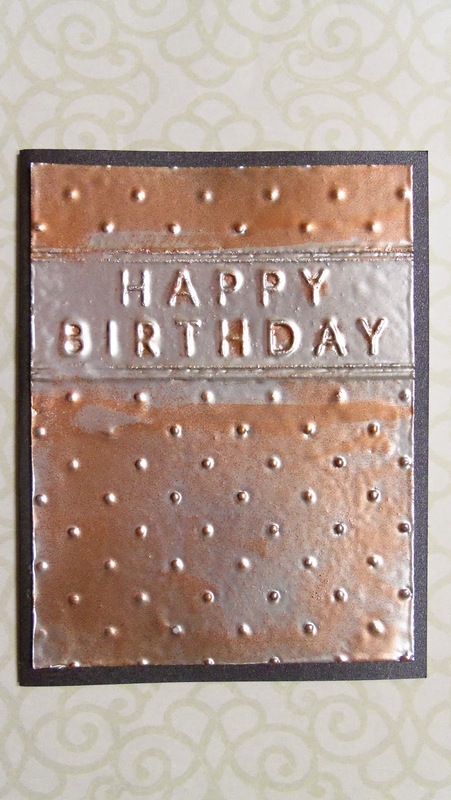 I am here with the first of five birthday cards I made for the Simon Says Stamp Wednesday Challenge - Happy Birthday. Their Wednesday Challenge is 6 years old and they are giving away 6 prizes this week. Well, I forgot completely about it until Tuesday afternoon!!! Eeeek. I couldn't let a chance like that go by, right? So I got a bunch of my toys out that I hadn't used before and got to work making five cards, including this totally experimental rainbow mess of UTEE and distress inks!!! Ha. 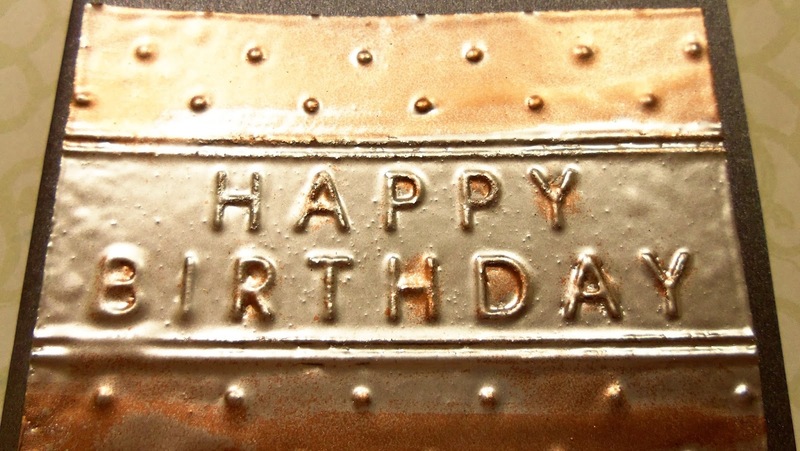 I hadn't made a really messy embossing powder project for a long time and I missed it. Wow...let me tell you...this ultra thick embossing enamel is really something!!! It's like a sloppy lake of thick glossiness all over my card! Yum....you can't keep from touching it to feel all the texture!!! 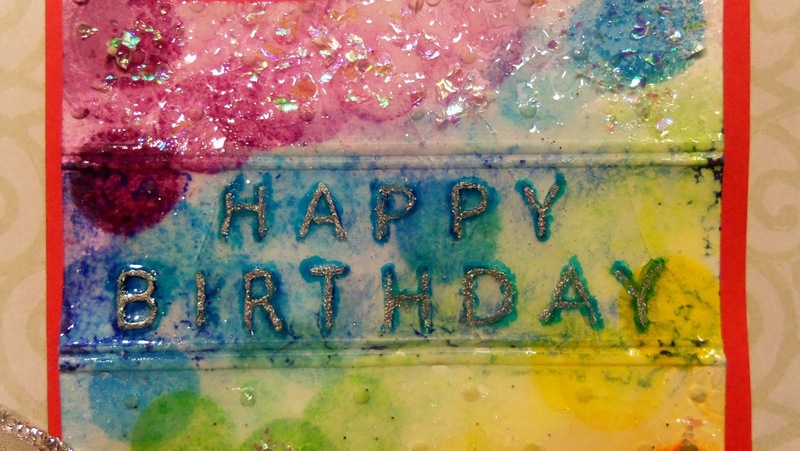 First I daubed distress inks in a rainbow pattern. The circles of color you see are from the round dauber sponge. Then I misted the extra thick cardstock with water before "dry" embossing (not too dry in this case!!) with my new Darice Birthday with Dots folder. Then I went crazy with the UTEE. I even added some fun shaved ice glitter flakes on for fun. I had a bunch of failed procedures with the actual Happy Birthday portion of the card. 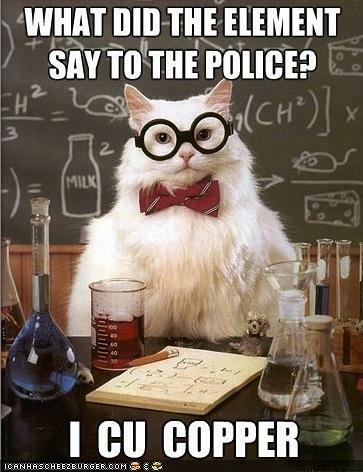 Suffice it to say that Spectrum Noirs react with UTEE in a most unexpected way....!!!! One hour plus several different kinds of silver markers (and more embossing powders to seal over the silver markers) later ....I finally had that botch taken care of. I really like the final result of the letters.....but don't even ask me to recall my procedure(s)......groan.......!!! Okay....one card posted. I figure by posting this mixed media extravaganza first, maybe most of you won't actually scroll down this far to see it!!! Ha. On to the next..... See you soon!!! 4. 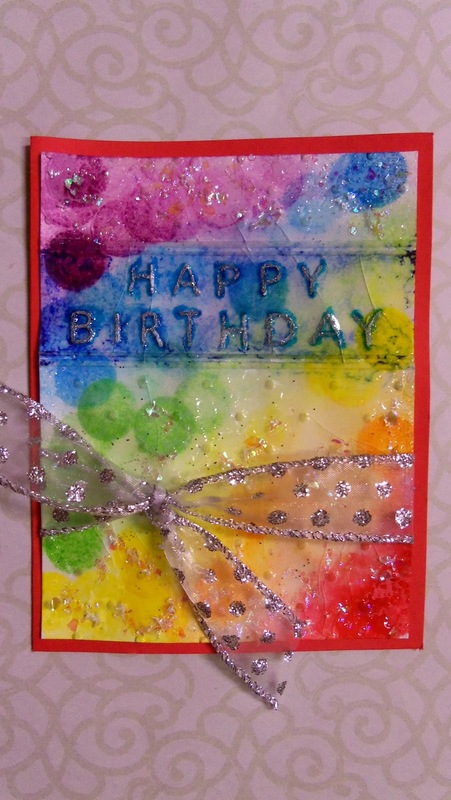 Simon Says Stamp Monday Challenge - A is for.....All the Colors of the Rainbow!!! 6. 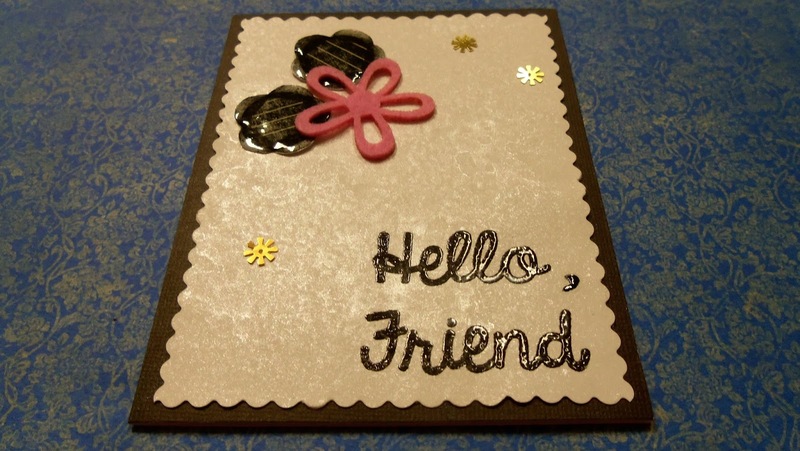 Design Memory Craft April 2015 Challenge - Creativity - I like getting creative with embossing powders! I'm here with an Easter card to share with you today and to wish each of you a blessed and joyful Easter. The sacrifice of Jesus Christ, God's son, on the cross to pay for the sins of each of us.....and His resurrection on the third day....is central to my life. Because of that, I am sharing a sacred Easter card for my Resurrection Day post. 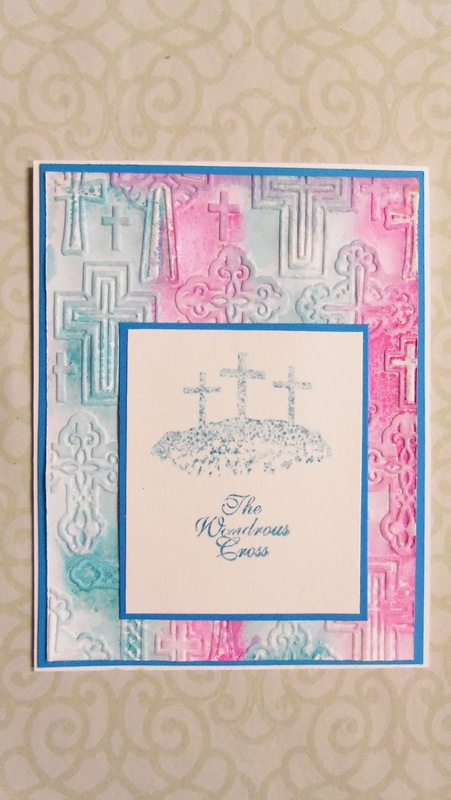 I made the background by applying Distress inks (Salty Ocean and Picked Raspberry) directly to my Darice - Crosses embossing folder. I misted it gently with water, and ran it through my Big Shot with watercolor paper. LOVE this pretty pastel-to-bright watercolor look!! The crosses and sentiment are from a retired Clear Dollar Stamp set - Jesus Paid it All. Perfect for Easter! 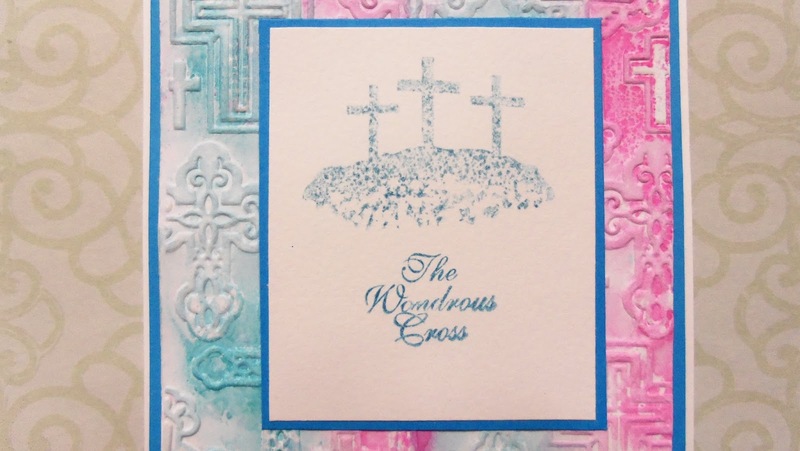 I stamped the crosses once on scrap paper and then onto watercolor paper for a muted effect. The sentiment was stamped directly. I used Distress Ink - Salty Ocean for both. Blessings to each of you this special day of celebration!!!! I pray that you also know the love, forgiveness, and new life that comes through Jesus Christ.